Though beaches are what spring to mind when you think of Mauritius, therea��s a lot more the tiny island has to offer. From gardens to golf courses, what not to miss while there. Venture away from tourist hotspots like Grand Bai and head to Blue Bay beach, located near the old capital, Mahebourg. With lesser footfalls and a more relaxed atmosphere, the waters at the beach have rarer corals than the Great Barrier Reef. Take a glass-bottom boatA� out and see the amazing marine life a�� including corals that bloom once every decade a�� and maybe try some snorkelling, too. Gris Gris, with its dramatic crashing waves, stunning black rocks and tufty grass is also a must-visit. Escape the crowds by heading to Ile aux Cerf for water sports, luxury dining and street food. Loosely translated as Donkey Island, it also offers an 18-hole golf course. We recommend the catamaran day trip, including food and activities, for 64 Euros a�� a small price for swimming with dolphins and sightingA� whales. Dolswim LTD, an environment-friendly company, will take you right into the midst of the dolphin community where you can watch mothers and babies frolic, and relax with them as they recover from a nighta��s hunting. The gardens are great to visit too, and will keep you occupied all day. Bring a picnic or indulge in some gateaux piment or dholl puri at a road side stall. Casela Nature Park is another place to visita��famous for its pink pigeons, parrots and giant tortoises, which you can interact with. You could even get theA� opportunity to walk with tigers! For more bite, head to the Crocodile Park, where crocodiles and alligators roam free in the reserve. No visit to Mauritius is complete without seeing the iconic seven-coloured earth a�� a result of decomposition of volcanic rock. 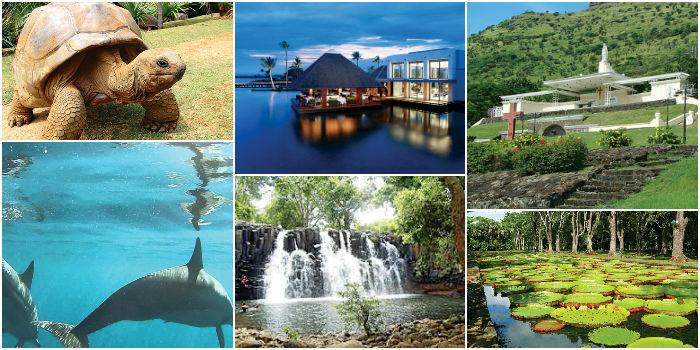 Mauritiusa�� dormant volcano, Trou aux Cerfs, is also worth a visit. You can even scamble down to the bottom and pose by the mouth of the volcano. For history buffs, The National History Museum, housed in an old Colonial mansion a�� chockfull of antique maps and creaking parts of old ships a�� is a must-see. The Government House in Port Louis, and the chapel and shrine of Marie Reine de la Paix are also exquisite. Another attraction is Fort Adelaide, a yester-year fortress built in the Moorish style, which now houses little tea shops and boutiques selling handcrafted treasures. Foodies must visit the Sugar Museum and Factory, as well as the house of Rault biscuit, the perfect accompaniment to a cup of milky Mauritian vanilla tea. Their pastel-packaged biscuits make for great gifts, too. Being an island, seafood comes highly recommended. If you dona��t fancy formal fare, go for a a�?grilladea�� on the beach where the catch of the day a�� everything from tuna steaks to crabs and lobsters a�� are grilled and served with a choice of sauces, freshly baked bread and a squeeze of lemon. For something a bit more upmarket, The Caudan Waterfront in Port Louis has a great choice of restaurants and bars. Head to Rose Hill for Dewaa��s famous dholl puris. The restaurant often runs out as early as 1 pm, so make sure you are first in line to sample these delicious flaky rolls, filled with a choice of sauces. Also try the delicious pastries like the authentically Mauritian puits da��amour (cream-filled French pastry) served at Patiserrie Imacule. A favourite with the British Royals, Le Touessrok Hotel boasts a golf course, spa, stunning views across the Indian Ocean, restaurants and bars. Perfect for a romantic getaway, enjoy traditional sega dancing on the beach as you sip a coconut cocktail and enjoy a five-star dining experience. If you want something just as idyllic, but with rustic charm, then Veranda Pointe aux Biches Hotel is where you should go. The hotel channels a barefoot vibe, with contemporary dA�cor, a lagoon swimming pool and a sandy white beach just steps away. Starting from 700A� Euros for a night. Finally, make sure you tear yourself away from the beaches when youa��re on this tropical paradise, because therea��s quite a lot to doa��from sampling its world-famous rum and sugar, to visiting the Rochester water falls and Lion Mountain, to learning sega dance. But we know thata��s often easier said than done.